A change is coming. And sooner than you think it could be time to say "goodbye" to keyboards, the mouse and even touchscreens and "hello" to Siri, Alexa and Cortana. Voice may still be in its early days as a human-machine interface, but it's already building a legion of fans who have fallen for its simplicity, immediacy and crucially, how natural it feels. In other words, welcome to the business and customer relation channel of the future. Drawing upon its existing experience in the design, development and implementation of conversational tools, plus all available existing data, TSC has been reflecting on the topic for some time. 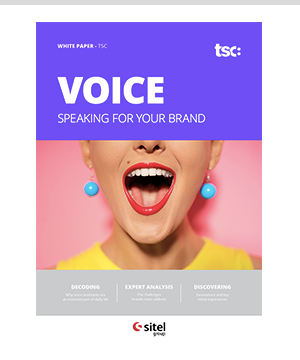 It has built the clearest picture of this channel's true business potential, as well identifying the right strategy for brands that are ready to create a vocal presence that its customers will hear loud and clear. 2.1 How will customers hear you? According to our policy of confidentiality, your data will not be shared with third parties.